1. Preheat the oven to 200ºC, gas mark 6. Toss the beetroot and potatoes in 1 tbsp oil, season and roast for 20-25 minutes until tender. 2. Meanwhile, blend the remaining oil with the horseradish and vinegar. 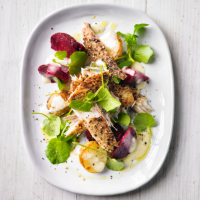 Toss in the mackerel, broken into pieces, watercress, beetroot and potatoes.